My college roommate, Vanessa, is now a marine biologist. When we roomed together, she would sometimes squirt me with a plastic fish when I entered our room. When Munchkin was born, Vanessa sent him an amazing mobile with fish that she knitted. When I found out Vanessa was expecting, I knew that the baby quilt had to be fish. Baby Spencer arrived last month and I am finally ready to send this his way. I was inspired by this quilt by Cathy from Sane, Crazy, Crumby Quilting. She used her leftover "crumbs" to make blue fish. I knew I wanted my fish to be all colors. 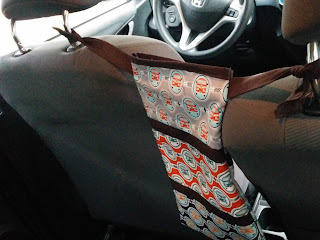 I've been saving leftover pieces of my I Spy fabrics for a while. I color sorted them and then just went to town! I had a really good time with this quilt. 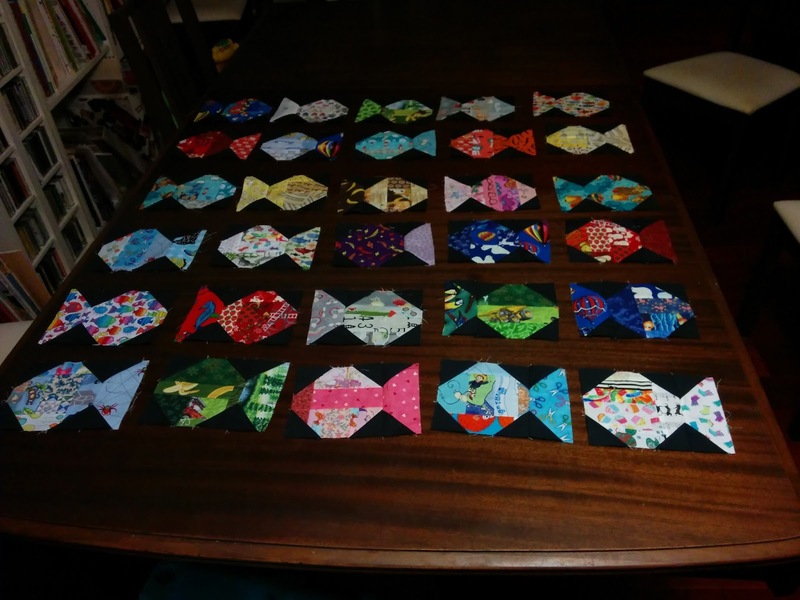 There are 3 or 4 fish made from bigger pieces, but almost all of the 30 fish are using up scraps. Specifically, I Spy scraps. The very best kind! 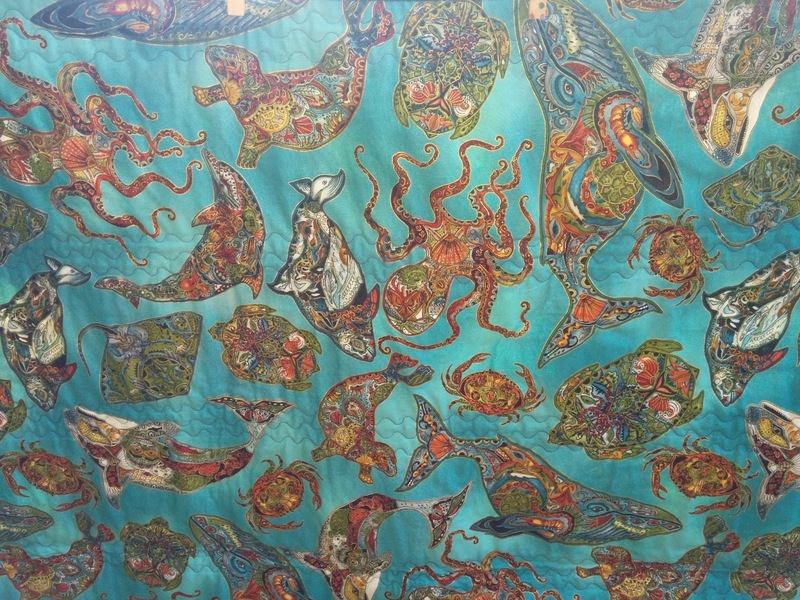 The background fabric is Kona Pepper. I quilted it using a blue variegated thread by King Tut that I already had. 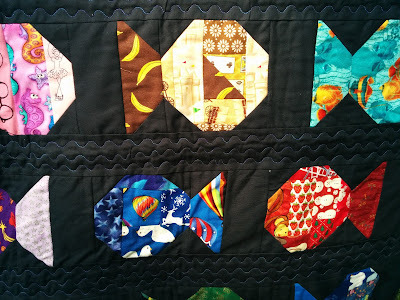 I really like the wavy lines as quilting, and while I don't usually like my quilting enough to intentionally make it visible, I like it in this quilt. The back is a fabric I bought in Alaska on my honeymoon. 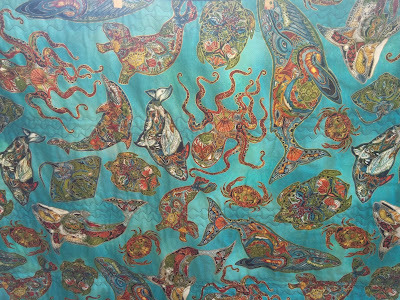 I have 3 different 1-yard cuts of fabrics by Sue Coccia, all from the Animal Spirits line. I love them but hadn't used any since buying them 4 years ago, and this ocean-themed print seemed perfect for this quilt. I did have to use a few bits of solid green & blue to make it large enough, but I didn't get a good picture of the entire back. 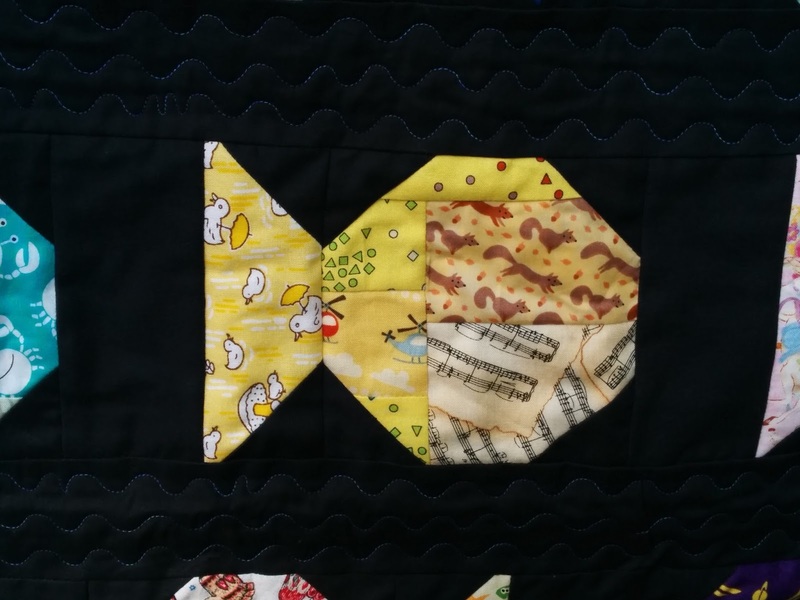 At one point while I was working on the binding I held the quilt up for my son (not quite 3 years old) and asked him what it looked like. I was hoping for him to validate that these were clearly fish. Instead, he started shouting out the things he could see. "Tiger! Monkey! Banana! More Monkey!" I'm calling that success! After all, what good is an I Spy quilt if you don't play I Spy? 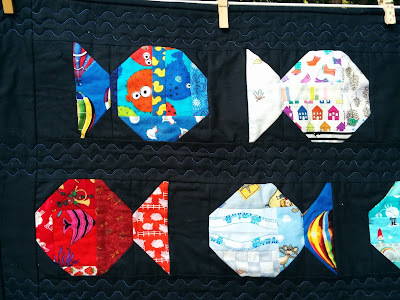 Finishing this quilt was my One Monthly Goal for August in the OMG linkup hosted by Heidi of Red Letter Quilts (goal setter #35). 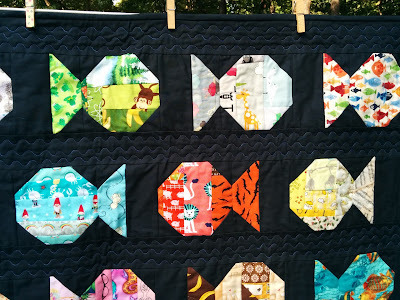 This quilt was also on my list of Q3 goals for the globally hosted Finish Along. I will also eventually be linking up with Cynthia's Oh Scrap! and She Can Quilt's Scraptastic Tuesday. This is seriously one of my favorite scrap quilts I have ever made. I hope Vanessa & Spencer love it! 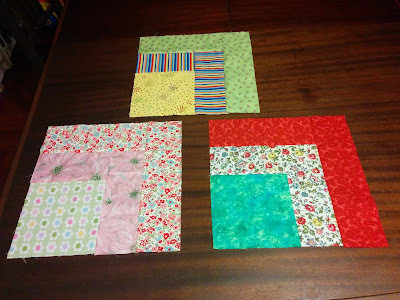 Queen Sandy asked for quarter log cabin blocks in bright summer colors. I wasn't entirely sure what her version of bright summer colors entails, but hopefully at least one of these three fits! This was a quick & easy block. I also sent 2 extra bock centers, one of he green mottled and one of the yellow. I've long had a log cabin quilt on my bucket list. Some day! Next month is my turn as Queen and I am so excited! I've known what I wanted to ask for since I signed up, but I was worried someone from my hive would ask for it before my month came around and I didn't want people to have to make it twice. But I am now in the clear and working on my test blocks! My friend Snow & I share a longing to have a VW bus. Neither of us has one, and both of us have husbands who think that a VW bus is a bad idea, safety hazard, etc. So it's likely neither of us will ever actually own or drive a VW bus. But we can dream! 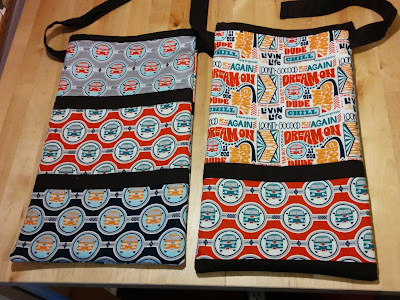 Snow recently scored a layer cake of VW bus fabric, and she generously gave me a square of each print. 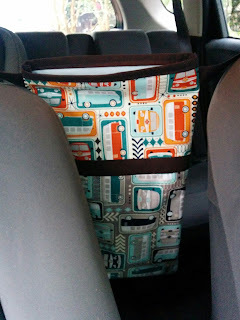 The car trash bag I made myself several years ago from a pattern in the book One Yard Wonders is literally falling apart at the seams and I have been meaning to make a replacement. So why not bring a little VW bus into my Honda Fit? I had enough fabric to make one for Snow, too. Mine is on the left and hers in on the right. The photo above is one side, and the reverse is below. 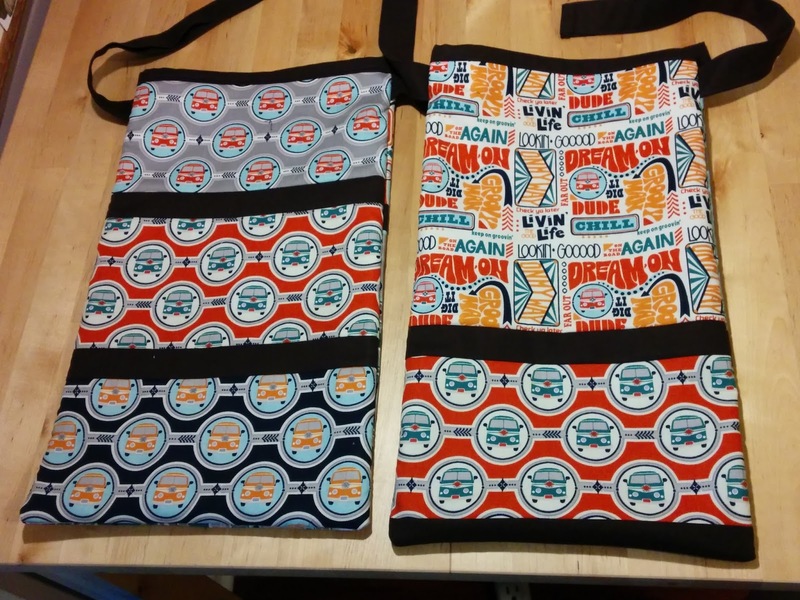 I am not a big fan of text in my fabric, but Snow is, so she got the word-heavy prints. The solid is Kona Espresso. 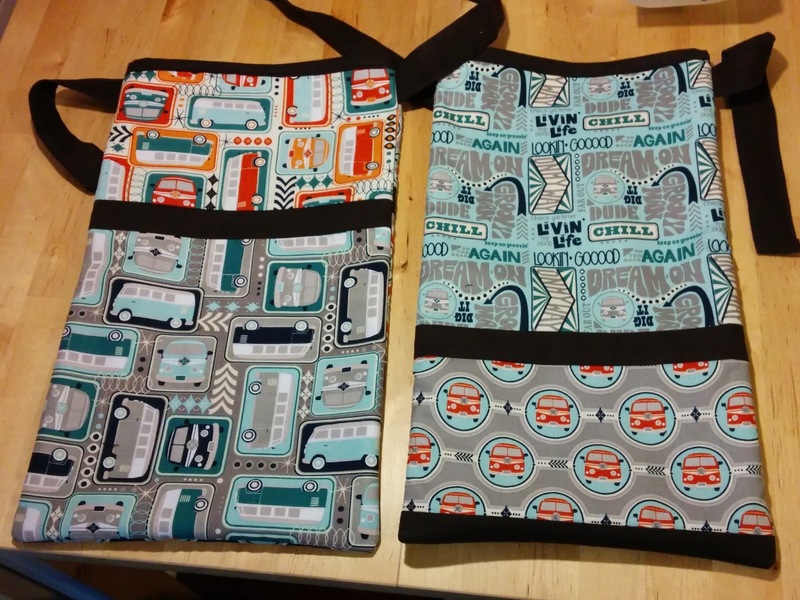 I've made adjustments to the original pattern, including lining my bags with PUL. 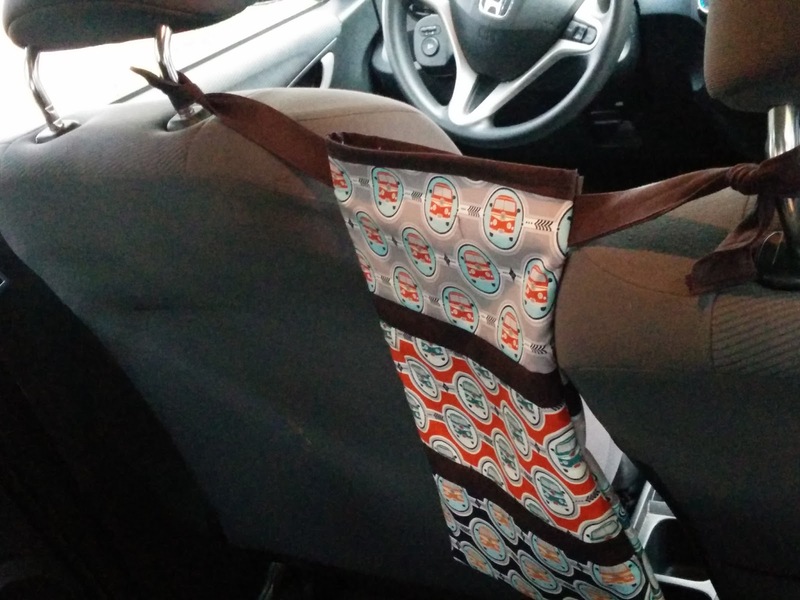 I also don't use the clip in the original pattern, because I tie mine between the two seats, rather than hang it behind one seat. Honestly, these ties came out a little short. Husband suggest that I add some velcro to the ends instead of tying, and he's probably right. 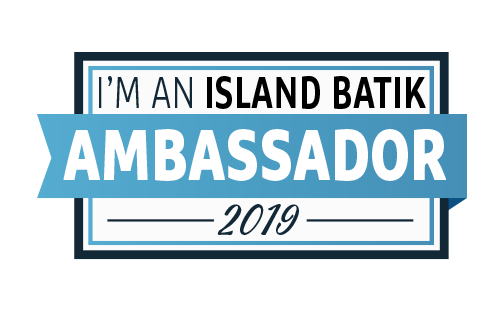 I don't think I have any right now, so I haven't done that, but if after having it in my car for a while I think there is not enough slack, I will do that. My roommate in college, Vanessa, had a baby boy last week. 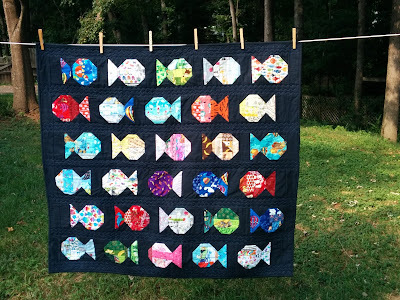 I've had a plan for the baby quilt for a while and have been working on creating fish out of my I Spy "crumbs," inspired by this quilt from Crazy, Sane, Crumby Quilting. I now have 30 fish. 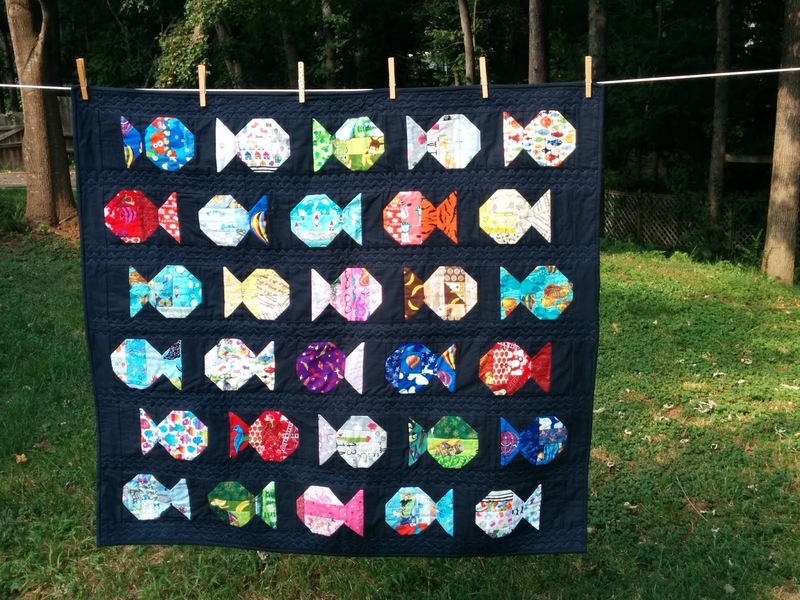 My August One Monthly Goal is to turn these 30 fish into a completed quilt. 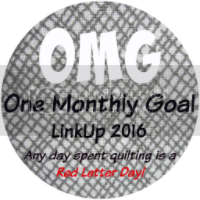 I'm linking up with Heidi at Red Letter Quilts for her awesome motivational monthly challenge.